In which is mentioned the Alphadelphia Association as the Washtenaw Phalanx, and the Lagrange Indiana community to which James Noyes went after the collapse of the Alphadelphia Association–as well did H. R. Schetterly, the founder of the Alphadelphia Association. “ASSOCIATION; OR, PRINCIPLES OF A TRUE ORGANIZATION OF SOCIETY. By this contrivance, which might be called a paper within a paper, Brisbane became the independent editor of a small daily, with all the Tribunes subscribers for his readers; and yet that journal could not be held responsible for his inculcations. It was known, however, that Horace Greeley, the editor-in-chief, was much in sympathy with Fourierism; so that Brisbane had the help of his popularity; though the stock-company of the Tribune was not implicated. Whether the Tribune lifted Fourierism or Fourierism lifted the Tribune, may be a matter of doubt; but we are inclined to think the paper had the best of the bargain: as it grew steadily afterward to its present dimensions, and all the more merrily for the Herald’s long peristence in calling, it “our Fourierite contemporary;” while Fourierism after a year or two of glory, waned and disappeared. “Before answering the question, How can Association be realized? we will remark that we do not propose any sudden transformation of the present system of society, but only a regular and gradual substitution of a new order by local changes or replacement. One Association must be started, and others will follow, without over throwing any true institutions in state or church, such as universal suffrage or religious worship. “If a few rich could be interested in the subject, a stock company could be formed among them with a capital of four or five hundred thousand dollars, which would be sufficient. Their money would be safe: for the lands, edifices, flocks, &c., of the Association, would be mortgaged to secure it. The sum which is required to build a small railroad, a steamship, to start an insurance company or a bank, would establish an Association. Could not such a sum be raised? “A practical trial of Association might be made by appropriation from a State Legislature. Millions are now spent in constructing canals and railroads that scarcely pay for repairs. Would it endanger the constitution, injure the cause of democracy, or shock the consciences of politicians, if a legislature were to advance for an Association, half a million of dollars secured by mortgage on its lands and personal estate? We fear very much that it might, and therefore not much is to be hoped from that source. “The truth of Association and attractive industry could also be proved by children. A little Association or an industrial or agricultural institution might be established with four hundred children from the ages of five to fifteen. Various lighter branches of agriculture and the mechanical arts, with little tools and implements adapted to different ages, which are the delight of children, could be prosecuted These useful occupations could, if organized according to a system which we shall later explain, be rendered more pleasing and attractive than are their plays at present. Such an Association would prove the possibility of attractive industry, and that children could support themselves by their own labor, and obtain at the same time a superior industrial and scientific education. The Smithsonian bequest might be applied to such a purpose, as could have been Girard’s noble donation, which has been so shamefully mismanaged. “The most easy plan, perhaps, for starting an Association would be to induce four hundred persons to unite, and take each $1,000 worth of stock, which would form a capital of $400,000. With this sum, an Association could be established, which could be made to guarantee to every person a comfortable room in it and board for life, as interest upon the investment of $1,000; so that whatever reverses might happen to those forming the Association, they would always be certain of having two great essentials of existence – a dwelling to cover them, and a table at which to sit. Let us explain how this could be effected. “The stockholders would receive one-quarter of the total product or profits of the Association; or if they preferred, they would receive a fixed interest of eight per cent. At the time of a general division of profits at the end of the year, the stockholders would first receive their interest, and the balance would be paid over to those who performed the labor. A slight deviation would in this respect take place from the general law of Association, which is to give one-quarter of the profits to capital, whatever they may be; but additional inducements of security should be held out to those who organize the first Association. “The investment of $1,000 would yield $80 annual interest. With this sum the Association must guarantee a person a dwelling and living; and this could be done. The edifice could be built for $150,000, the interest upon which, at 10 per cent, would be $15,000. Divide this sum by 400, which is the number of persons, and we have $37.50 per annum, for each person as rent. Some of the apartments would consist of several rooms, and rent for $100, others for $90, others for $80, and so on in a descending ratio so that about one-half of the rooms could be rented at $20 per annum. A person wishing to live at the cheapest rates would have after paying his rent, $60 left. As the Association would raise all its fruit, grain, vegetables, cattle &c., and as it would economize immensely in fuel, number of cooks, and every thing else, it could furnish the cheapest priced board at $60 per annum, the second at $100, and the third at $150. Thus a person who invested $1,000 would be certain of a comfortable room and board for his interest, if he lived economically, and would have whatever he might produce by his labor in addition. He would live, besides, in an elegant edifice surrounded by beautiful fields and gardens. “If one-half of the persons taking stock did not wish to enter the Association at first, but to continue their business in the world, reserving the chance of so doing later, they could do so. Experienced and intelligent agriculturists and mechanics would be found to take their places; the buildings would be gradually enlarged, and those who remained out, could enter later as they wished. They would receive, however, in the mean time their interest in cash upon their capital. A family with two or three children could enter upon taking from $2,000 to $2,500 worth of stock. “We have not space to enter into full details, but we can say that the advantages and economies of combination and Association are so immense, that if four hundred persons would unite, with a capital of $1,000 each, they could establish an Association in which they could produce, by means of economical machinery and other facilities, four times as much by their labor as people do at present, and live far cheaper and better than they now can; or which, in age or in case of misfortune, would always secure them a comfortable home. “In Massachusetts, already there are three small Associations, viz.. the Roxbury Community near Boston, founded by the Rev. 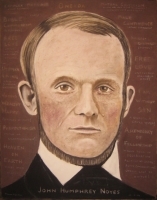 George Ripley; the Hopedale Community, founded by the Rev. Adin Ballou: and the Northampton Community, founded by Prof. Adam and others. These Associations or Communities as they are called, differ in many respects from the system of Fourier, but they accept some of his fundamental practical principles, such as joint-stock property in real and movable estate, unity of interests, and united domestic arrangements, instead of living in separate houses with separate interests. None of them have community of property. They have been founded within the last three years, and two of them at least under the inspiration of Fourier’s doctrine. “In the state of New York there are two established on a larger scale than those in Massachusetts: the Jefferson County Industrial Association, at Watertown, founded by A. M. Watson, Esq. ; and another in Herkimer and Hamilton Counties (on the line) called the Moorhouse Union and founded by Mr. Moorhouse. A larger Association to be called the Ontario Phalanx, is now organizing at Rochester, Monroe County. “In Pennsylvania there are several: the principal one is the Sylvania in Pike County, which has been formed by warm friends of the cause from the cities of New York and Albany; Thomas W. Whitley, President, and Horace Greeley, Treasurer. In the same county there is another small Association, called the Social Unity, formed principally of mechanics from New York and Brooklyn. There is a large Association of Germans in McKean County, Pennsylvania, commenced by the Rev. George Ginal of Philadelphia. They own a very extensive tract of land, over 30,000 acres we are informed, and are progressing prosperously: the shares, which were originally $100, have been sold and are now held at $200 or more. At Pittsburg steps are taking to establish another. “A small Association has been commenced in Bureau County, Illinois, and preparations are making to establish another in Lagrange County, Indiana, which will probably be done this fall, upon quite an extensive scale, as many of the most influential and worthy inhabitants of that section are deeply interested in the cause. “In Michigan the doctrine has spread quite widely. An excellent little paper called The Future, devoted exclusively to the cause, published monthly, has been established at Ann Arbor, where an Association is projected to be called the Washtenaw Phalanx. ‘In New Jersey an Association, projected upon a larger scale than any yet started, has just been commenced in Monmouth County: it is to be called the North American Phalanx, and has been undertaken by a company of enterprising gentlemen of the city of Albany. The most important result of Brisbane’s eighteen month’s labor in the Phalanx was the conversion of Brook Farm to Fourierism. William H. Channing’s magazine, the Present, which commenced nearly at the same time with the Phalanx, closed its career at the end of seven months, and its subscription list was transferred to Brisbane. In the course of a year after this Brook Farm confessed Fourierism, changed its constitution, assumed the title of the Brook Farm Phalanx, and on the 14th of June1845 commenced publishing the Harbinger, as the successor of the Phalanx and the heir of its subscription list. So that Brisbane’s fourth advance was the transfer of the literary responsibilities of his cause to Brook Farm. This was a great move. A more brilliant attorney could not have been found. The concentrated genius of Unitarianism and Transcendentalism was at Brook Farm. It was the school that trained most of the writers who have created the newspaper and magazine literature of the present time. Their work on the Harbinger was their first drill. Fourierism was their first case in court. The Harbinger was published weekly, and extended to seven and a half semi-annual volumes, five of which were edited and printed at Brook Farm, and the last two and a half at New York, but by Brook Farm men. Its issues at Brook Farm extend from June 14, 1845, to October 30, 1847; and at New York from November 6, 1847 to February 10, 1849. The Phalanx and Harbinger together cover a period of more than five years. Other periodicals of a more provincial character, and of course a great variety of hooks and pamphlets, were among the issues of the Fourier movement; but the main vertebrae of its literature were the publications of which we have given account – Brisbane’s Social Destiny of Man, his daily column in the Tribune, the monthly Phalanx, and the weekly Harbinger.